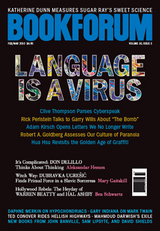 Dream Couple: As fate would have it, soon after I finish my review of Ugresic’s book of essays, I get the shiny, new Bookforum in my mailbox that features none other than THE Mary Gaitskill reviewing the new novel by THE Dubravka Ugresic. Am I dreaming? Is Bookforum living in my brain? Ugresic’s new novel is Baba Yaga Laid an Egg reworks a Russian myth into some startling innovative fiction. I have yet to read the whole novel, but I have heard good things and have it displayed prominently on the to-read shelf. And perhaps none too many folks are aware of my love for Bookforum, but let this serve as a reminder – I love Bookforum without shame. Because not only do we get the magical pairing of Gaitskill and Ugresic, but then we have a triumvirate review of the Palestinian poet Mahmoud Darwish’s works. And if that’s not enough for you to at least check out their website, how about a review of Norwegian Karl O. Knausgaard’s new novel, A Time for Everything. I have to give Bookforum major kudos for including not one, but two Archipelago books. In a book world that is overshadowed by e-reader mania, Bookforum consistently brings back the focus to good literature from here and abroad. Earth, Wind and Fire: And Water. Thanks to my book friend, Meryl Zegarek, I have the complete Ox-Tales collection. Who would want that, you ask? Any reader that I know! Ox-Tales is a collection of four books, each named after an element – earth, air, fire and water. In each collection, British and Irish writers have written stories based on that element. What’s even better about metrushka doll of elements is that all the donations go to Oxfam, a global organization dedicated to reducing poverty and injustice and providing emergency relief. The projects that Oxfam has are divided into four categories – Earth/Livieliehoods, Air/Climate Change, Fire/Conflict and Water. Read and donate? What a brilliant idea! All sales are donated to Oxfam and you can buy your copies here(available only through the UK site). And if the charity angle doesn’t grab you, how about the literary angle that includes writers such as: Zoe Heller, Al Kennedy, Hanif Kureishi, Vikram Seth, Jeanette Winterson, Kate Atkinson, William Boyd, Mark Haddon, John Le Carre, Lionel Shriver, Ali Smith and Rose Tremain, just to name a few. The world deserves this and so do you.